below 0.05 mg/m3 TLV (Threshold Limit Value) as per OSHA. draws all mercury vapor and dust through the filter media. 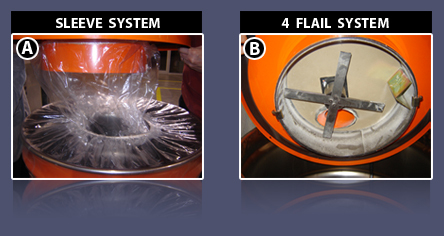 • Our patented sleeve system (see image A) allows the user to never be exposed when changing drum. to vapor or more importantly to shattered glass. by the system to ensure optimal performance and safety. to create finer glass particles and to be able to have as many as 20% more crushed tubes per drum. • Our double crushing chamber allows the unit to stay below 65db of noise even when crushing occurs.